Baseball season is upon us! Once again all fans are full of hope that this will be “the year” for their team ….even if those hope are destined to be dashed before the end of May. As far back as I can remember, I have enjoyed baseball. 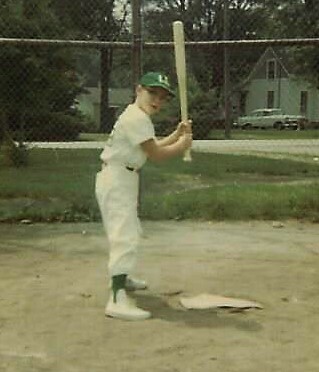 I can remember being disappointed in second grade when many of my classmates were old enough to play baseball, but because my birthday was after the cutoff date the only thing I could do was wait for one more long year to play on a team. But before I ever put on a hot, scratchy, wool Little League uniform, I had played hours upon hours of baseball. I do almost everything right-handed; however, anything with a two-handed grip, I do left-handed. There are advantages to batting left-handed: it puts you a step closer to first base plus your momentum is already carrying you towards first base as you follow-through on your swing. Despite the advantages, there is only one reason why I bat left-handed: my big brother is left-handed. If you have an older brother, the odds are that you looked up to him when you were little. Having a brother who is eight years older gave me a lot to look up to. He was always bigger, faster, stronger, smarter than I was. Of course there were times when he could be a pain – literally – like the time he said he was going to teach me to box which was really just an excuse to hit me for a while. But I looked up to him and I wanted to be like him, so I started batting left-handed and always have. He threw me an awful lot of batting practice and he had some unique approaches to teaching the art of hitting. His cure for when I was afraid of getting hit by a pitch? He would deliberately throw at me! If I hit the pitch then it did not hit me. I suppose there some twisted logic there somewhere. This entry was posted in Uncategorized on April 4, 2017 by Leonard. “Momentum going towards first”… I like it. Good luck to your Reds this year!